In America this dish is usually served at Thanksgiving but here we make it for Hallowe’en, altough equally often we just hollow pumpkins out to make a lantern! 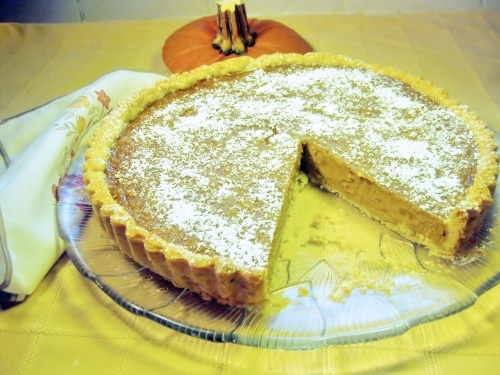 Use the flesh that is hollowed to make this delicious spicy tart instead. Pumpkins are in the shops now so let’s make good use of them. I bought mine at Fiveways Fruits and would like to thank Danny and his staff for always being so helpful. Rub the fats into the flour and salt until like fine breadcrumbs. Stir in the sugar then just enough water to make a firm dough. Wrap in clingfilm and leave in the refrigerator for 30 minutes. Peel and de-seed the pumpkin , cut into small pieces, place in a saucepan with water to cover. Bring to the boil and simmer until soft, approximately 20 minutes. Drain well, mash and place in a sieve for all the liquid to drain away. Grease the tin. Heat the oven to Gas 6 /200C. Roll out the pastry fairly thinly and line the tin, being careful not to stretch it, trim the edges. Prick with a fork, press in a piece of foil. Bake for 10 minutes then remove the foil and bake for a further 5 minutes. Remove from the oven and lower the temperature to Gas 5 /190C. In a bowl beat the pumpkin purée with the eggs, sugar, cream, salt and spices. Pour in to the pastry case and bake for 35 – 40 minutes until it is firmly set. If using a tin, leave for a few minutes before removing it. It is excellent served with crème fraiche.